It's the heart of the ski season, so get yourself here and ski your heart out! We've made this a carpool weekend to give you maximum flexibility. 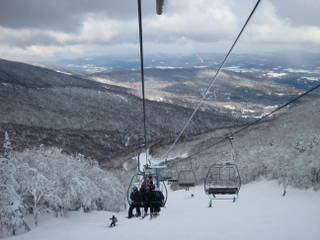 Ski Sugarbush, or Mount Ellen, or Mad River Glen (yes, you can! ), or snowshoe, or cross country -- whatever you and the conditions are good for. On your way back to our cozy lodge, visit the shops in Waitsfield, Then relax by the fire, enjoy our sauna, dinner, game room and party. Reservations are open Jan 18 - Feb 1. To reserve, click the "Register" button now. Any question? Contact the Reservationist, Sevinc, at PrimeSki@SwissSkiClub.org. She'll arrange carpools to find you a ride or riders. For details, see Rates and Procedures or contact Reservationist.